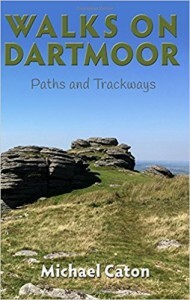 With the knowledge of a lifetime walking on Dartmoor, my father has just published a unique walking guide. The book guides walkers into the heart of the moor following paths and tracks, many of which are ancient and have their own interesting stories. It starts with an introduction to the moor and the many antiquities that can be found here, then each walk descibes not only the route but snippets of information on points of interest along the way. Having checked many of the walks I can thoroughly recommend them! Using over sixty years of knowledge of Dartmoor, Michael Caton leads you on a series of 28 walks based on paths and trackways over the moor. Some of these walks are based on those led by the author for the Dartmoor Preservation Association. Many of the walks have not been described in previous guidebooks or are not shown on the OS 1:25,000 map. The walks are for those who wish to venture well into the open moor without having to negotiate the rough Dartmoor terrain. A section has been included on the origin and history of the tracks including special comment on the route of the well known Abbot’s Way. There is also a section describing briefly what to see on the walks, including prehistoric monuments, medieval and later remains such as mining and granite crosses, as well as flora and fauna. The walks have been arranged in order around the southern and then the northern moor. Each walk starts at a suitable parking place. The routes are described in detail with appropriate grid references and brief information on the scenery and features to be seen. The start of all the walks is shown on an overview map of Dartmoor. About half of the routes are circular whereas others are more suited to a linear course. The walk descriptions are accompanied by maps in which the route has been sketched out on the appropriate section of the 1:25,000 OS map. A separate section gives advice to walkers and explains how to use this guide. It also draws attention to safety issues of walking on Dartmoor, including the dangers of military firing and adverse weather conditions. The book can be purchased from the publisher, Matador http://www.troubador.co.uk/book_info.asp?bookid=4768 , other online outlets, or traditional bookshops.